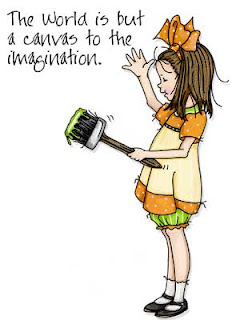 The world is but a canvas to the imagination! What did you do this weekend? Well, I finished up a couple of custom drawings and began working on some new collections, cards and singles. I was sketching away on the sun porch most of the day Saturday, enjoying the almost fall weather. It's still been so warm here in Virginia. I wish fall would get here! It's been so nice in the morning, but the days have been more like summer, being in the 80's. Could someone please send some autumn breezes my way! As I was working on new collections, I dug in to my long list of requests from customers and one of the big ones, was children painting, so that is the collection that I'm working on right now. This sweet little gal is just one of those images. There are many more sketches waiting to come to life. I'd love to hear your ideas as well. So be sure to drop me a note or simply post a comment if you wish to add any of your thoughts.